Within the city location this fort is visible from all parts of the Gwalior city. Going back to history because of its strategic location close to Agra and Delhi this fort has seen many rulers and conquerors in history of India. With every change of ruler at Delhi the Gwalior fort faced several wars. Gwalior fort has two entrances. 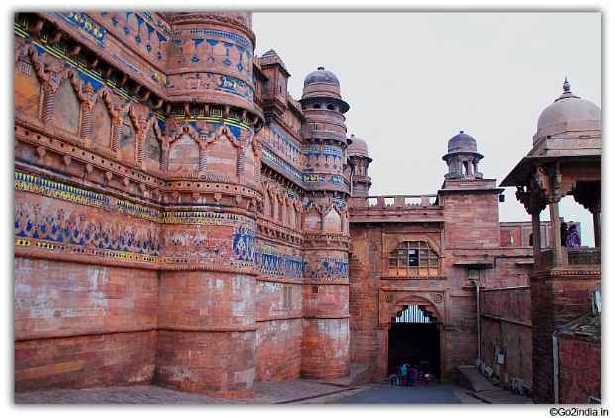 The gate close to the city is known as Gwalior gate as it is close to busy market place of Gwalior city. As the fort is located at top of a hill there is a sloppy climb of nearly 1 KM is there to reach the elephant gate or close to the fort top entrance. It will be a 20 minute of gentle climb on the rocky but well maintained road. Two wheelers travel in this road to the top of fort but no four wheelers are allowed. 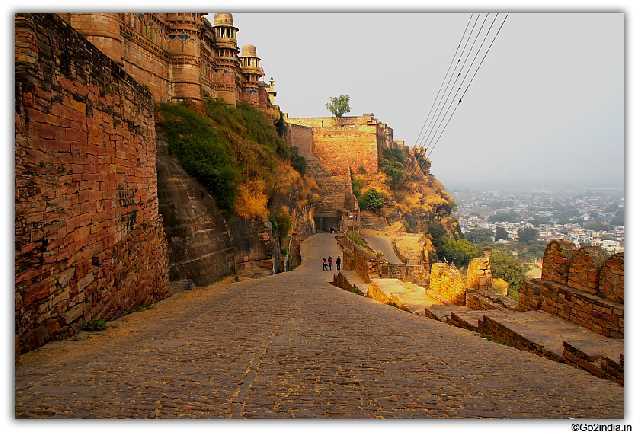 To avoid this climb you can take your taxi or vehicle through other gate known as Urwahi Gate which will take you to top of the fort avoiding the climb. This gate is usually used by all types of tourist visiting the fort other than locals. If you don't have vehicle and ready to climb then take a drop at Gwalior gate and on return you will always get vehicle ( auto taxi ) at the gate to travel to any part of Gwalior town. However you won't get public transport through Urwahi gate ( going upto the top of the fort ). You must hire a vehicle or carry your own vehicle if you are using Urwahi gate. 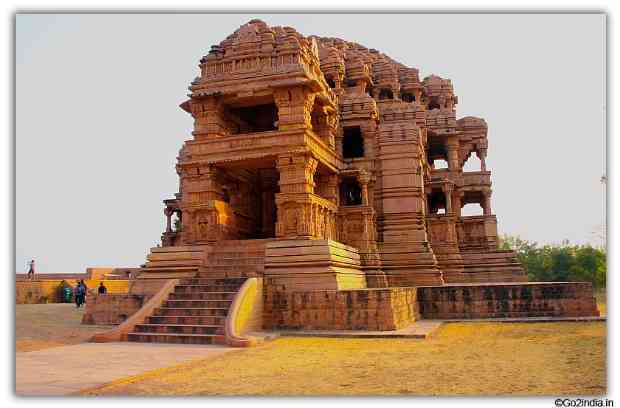 You can visit this fort through out the day but it is advisable to visit this for around 2 PM as you can finish the visit by 6 PM and watch the light and sound show conducted after dark and return to Gwalior. Suraj Sen a rajput Chieftain was suffering from leprosy and came in search of drinking water to Gopachal hill while hunting. He met an ascetic named Gwalipa who gave him drinking water from his hut. After drinking the water Suraj Sen got cured of his leprosy and in return he asked the sage to name his own reward. The sage asked to enlarge and beauty the tank and to build a fort on the Gopachal hill. Suraj Sen fulfilled the wishes and given the name of the fort as Gwaliawar giving all respect to Gwalipa. 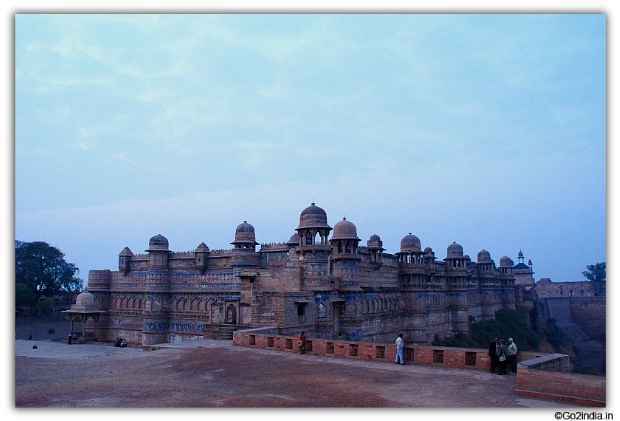 There are five dynasties who mainly ruled Gwalior fort. They are Kachhawaha, Tomar, Lodi, Mogul and Scindia. Vjradaman of the Rajput kachhapghata or Kachhawaha dynasty captured the fort from Pratihara of Kanauj towards end of 10th century. Tomar ruled throughout 15th century and first quarter of 16th century Many rock-cut Jain statues were constructed during this period. 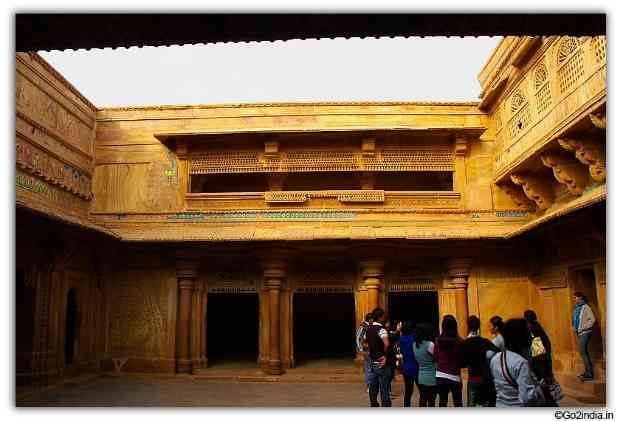 The best part of this fort history is the rule of Raja Man Singh ( 1486-1516 ) . Lodi took the passion of the fort shortly after the death of Raja Man Singh. After Lodi the fort went to Mogul and this place was used as a prison by Jahangir and then Aurangzeb. With the growing power of Marathas the fort came under the rule of Scindia. British took over the fort on several occasions and finally it was restored to Scindia in 1886 in exchange of Jhansi. The finest example of Hindu architecture can be seen in Man Mandir palace inside the fort. This palace was constructed by Maharaja Man Singh. The main building is two storeys high and there are another three floors under ground. The under ground floors are designed to pass sun light and ventilation inside and there is a unique communication system to talk between floors by using hollow pipes. These underground floors were used by the queens. Subsequently Aurangzeb has used this place as a prison and here he killed his brother Murad Baksh by poppy poisoning. There are several underground escape tunnels to allow occupants of the fort to escape during the war. These underground paths had some exposed opening for light and air however with the closing of those openings it became impossible and dangerous. Now the entrances to the escape ways are closed as some incidents took place as some enthuastic tourist tried to explore. The courtyards are well designed with floral patterns by using coloured titles. There is a legend about Raja Man Singh and his beautiful wife Mriganayana a Gujari by caste. The king fall in love with her after watching her bravery when he was out for a hunting. He constructed Gujari Mahal for her after fulfilling her wishes to bring water from her village upto the fort. Raja Man Singh is also remembered for his love for music. There is a music hall where singers from different parts were allowed to display their talent. Entry fee is Rs 5/- and still camera are not charged. ( Keep change of five rupees as hardly the person will have change of Rs 5 to return if you give him Rs 10). Preserve this ticket as they are required to visit Sas Bahu temple and Teli Ka Mandir . There is an archeologically survey of India museum which you will first see if you enter through Elephant gate. This building was used as a hospital during British period. Inside four galleries antiquities of 1st CBC to 17th CAD are on display. These items collected from different part of Gwalior and nearby areas like Viz-Amrol, Khairat, Ater, Naresar, Bateshwar, Mitaoli, Padhawali, Sihonia, Terahi, Surwaya. There are big Jain statues also on display. It will take 10 to 15 minutes to visit this small museum. There is a entry fee of Rs 5/- . Photography is not allowed within this gallery. Timing 9 AM to 5 PM, Friday this museum is closed. There are three main areas to visit inside the fort area ( outside the main Palace area ). Because of presence of two temples this is known as Sas Bahu ( Mother in law and daughter in law ) temple by the locals. Actually this one is a Vishnu temple also known as Sahastrabahu temple. This temple with several ornamental sculptures through out gives a majestic look from a distance. The small temple which is also dedicated to Vishnu have similar sculptures. There are two floors and ornamental pillars are used to support the dome of upper floors. Temple measures 102 feet x 74 feet. It is located at a five minutes walk or you can take your vehicle close to the temple. Teli means oil dealer. It seems that the original name was Telangana Mandir so called from the Dravidian form of its spire. Telangana mean Telugu country. So Teli Ka Mandir is subsequent corruption of Telangana Mandir. 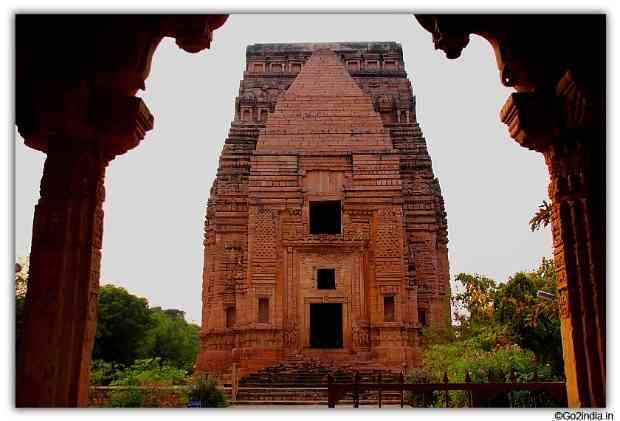 During the rule of king Mihira Bhoja of Pratihara dynasty this temple was constructed. Height of this temple is 30 meters. There are two parts one is main Garbhagriha or the place for main deity and the other one is Antarala to enter into the temple. Visible from a distance the main attraction of the temple is wagon-vaulted roof. This is a feature of Dravidian style or south Indian style of temple design. 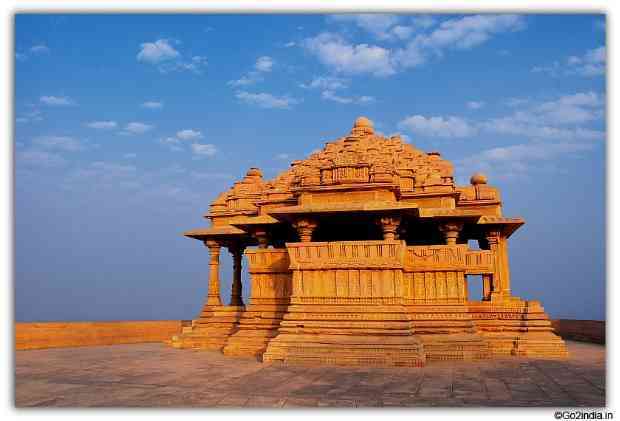 Below this the other decorative details are found in Indo � Aryan style of temple design found in north India. This temple is an example of amalgamation of north and south Indian temple design. The entrance gate and two other rooms were constructed in British period by Major Keith in the year 1881. Here also the same five rupees entry ticket you purchased to visit Man Mandir ( Man Singh palace ) will be required for entry. Visible from a distance this marble stone Gurudwara is constructed in memory of Guru Hargobind Sahib Ji the 6th.Guru of Sikhs. He was kept here as a prisoner by Mogal emporer Jahangir. On the request of his queen he announced release of Guru from the prison. Guru was reluctant to go alone and requested release of 52 prioners who were actually princes locked inside jail for various reasons. 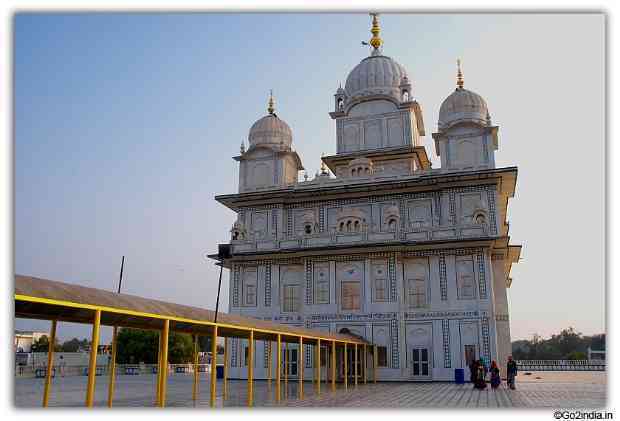 Feel free to visit this Gurudwara and have blessing of Gruji here. You can carry your camera , phones etc inside and there is no restriction on photography inside the campus. Free food or langar is organized daily here.